Is It Too Late To Short Sale Your Home? 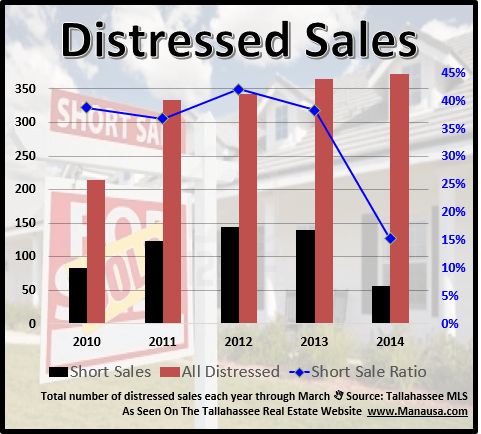 There have been 57 short sale closings in Tallahassee through May 2014, down 59% from the 140 closed through May in 2013. Before you start getting excited thinking that were are seeing an end to the plethora of distressed property sales in Tallahassee, you should also know that there have been 315 "other" types of distressed sales thus far in 2014, up 40% from the 225 closed through this time last year. So we have to wonder, are we right in the middle of the real estate recovery, or have we begun moving towards the end game? The status of the housing market recovery is of the utmost importance to people with a stake in the Tallahassee real estate market. We monitor the daily changes to the supply and demand of homes for sale in Tallahassee to let us know what to expect from future home value trend changes, but we also monitor the state of distressed properties in the market so that we know when equity sellers will be operating under historically normal conditions. Our real estate graph below shows the breakdown of distressed homes that have sold each year, whether or not they were short sale properties or foreclosures/bank-owned properties. In the graph above, the black bars and red bars measure short sales and all distressed home sales respectively and are recorded on the left vertical axis. The blue line measures the ratio of short sales to all distressed property sales in Tallahassee and is recorded on the right vertical axis. As you can see, short sales represented roughly 40% of all distressed home sales from 2010 through 2013, but a significant change has occurred in 2014. Note how the blue line plunges down to our present level of approximately 15%. I believe we are going to see the value of distressed properties begin to rise and close the gap with arms length properties. The biggest issue with short sales is the uncertainty of closing, so buyers with a time-table could not take the risk of bidding on short sales. Foreclosures are far less finicky. Most need some work prior to closing, but the majority of homebuyers can handle an extra week or two within the constraints of their time schedule. Ultimately, fewer short sales mean increased demand for distressed properties, which will mean rising prices. I believe this will cause some short-term competition for arms-length home sellers, and home prices (values) will be under pressure for the rest of the Summer. Banks are still willing to work with people who owe more money on their home than it is worth. Currently (June 3, 2014), the Mortgage Forgiveness Debt Relief Act has not been extended for 2014, but I believe it will. There is enough activity on it in Washington that most industry experts expect a retroactive extension that will cover the years 2014 and 2015. Sooner, rather than later should be your goal. You'll want to sell your home and restore your credit so that you can get back into the market before home values push too high (read about a homebuyer who used credit repair and bought a new home after a short sale). If you want to more about doing a short sale or how to fix your current housing condition, just drop me a note and we can schedule a time to review your home value and your current situation.